Bottom Line Saving and Flexibility. A partnership with San Jose Distribution Services will reduce your bottom line. SJDS offers substantial savings by putting you into the California market without additional investment in lease payments and payroll expenses. Partner with us and experience no lease costs, no payroll expenses, no property taxes and no wasted time. We will also reduce your bottom line by providing value-added warehousing services that accommodate your companies unique needs. 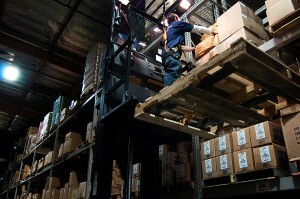 San Jose Logistics, Storage, Distribution, Fulfillment, Pick and Pack, Supply Chain Solutions. San Jose Distribution Services has been at the forefront of pick and pack fulfillment services for over 30 years. We have vast experience handling small and large pick & pack operations with inventories ranging from 100 to 44,000 skus. San Jose Distribution Service’s employees are experts in repackaging, re-labeling, kitting, UCC labeling, barcoding, and returned goods processing. Our warehouse management system is real time, which enables us to track your inventory from the time it is cycled at our facility to the time it is redistributed to your customer. We ship a large volume of small parcels via UPS and FedEx daily. Unload, label, ship; small parcel, LTL and TL. Unload, build orders and distribute. Since 1982, San Jose Distribution Services has operated the General Purpose Foreign Trade Zone for the city of San Jose. Our facility is located within 45 miles of the Port of Oakland. Click here for more information about the benefits of using a Foreign Trade Zone. Sanitation and Good Manufacturing Practices. Our goal at San Jose Distribution Services is to provide excellent sanitation and Good Manufacturing Practices. Through our sanitation practices and team efforts, we attract leaders in the food, pharmaceutical and medical industries. San Jose Distribution Services is one of the few warehouses in Northern California that is registered with the FDA for food grade storage and warehousing. We encourage our customers to visit our facility regularly. Location is everything. Rail-served. Located within 45 miles of the Port of Oakland and San Francisco. San Jose is centrally located in the San Francisco Bay Area and is an optimal place to serve California and the other 11 Western States. Our San Jose warehouse is located within 45 miles of the Port of Oakland and the Port of San Francisco. We also serve as a strategic warehouse partner for companies that are seeking a distribution partner for the city of Watsonville and the Salinas Valley. San Jose Distribution Services receives rail cars via the Union Pacific and we have been recognized nationally and internationally as an integral West Coast rail services partner since the early 1960s. San Jose Distribution Services has provided third party logistics for the following products and industries; semiconductors, solar panels, office supplies, software, electronic devices, pharmaceuticals, raw materials, packaging, glass bottles, retail displays, lighting, fixtures, furniture, air conditioning, heating, generators, machinery, automotive parts, insulation,lumber, OSB, plywood, newsprint, pulp board, MDF, soft drinks, bottled water, coffee, tea, olive oil, canned fruits & vegetables, dried fruits, rice, flour, sugar, quinoa, cereal, ginger, soups, sauces, health supplements, landscape products, pet food & accessories, cosmetics, retail clothing, hot tubs, surfboards, kayaks, paper materials, toys, games, communication products, food commodities and many more.